Marianne Faithfull is due to receive one of the highest cultural honours in France. The singer and actress - whose recording career stretches back to 1964 - is being made Commandeur de L'Ordre des Arts et des Lettres in Paris. Marianne, 64, will receive the honour from Frederic Mitterrand, French Minister of Culture and Communication, at Le Theatre du Chatelet in Paris where she is performing tonight (Tuesday). The award is made to recognise figures who have contributed to the "enrichment of the French cultural inheritance". The performer, who now lives in Paris and Ireland, will join an elite group of recipients including David Bowie, Sir Michael Caine, Patti Smith and Marcel Marceau. 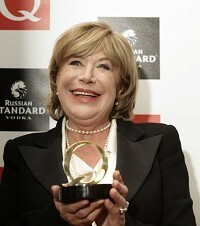 Marianne said: "I am very, very grateful to be so honoured." She attended when a friend, French singer Etienne Daho, was made an Officier des Arts. "I went to the ceremony but never thought I would be a recipient," she said. "Since I started coming to Paris in 1964 the French have welcomed me and been very loving. I met some very interesting people when I first came here, two of whom were Bruno Coquatrix, the great impresario who ran the Olympia theatre, and his wife, who is still alive and still a friend." Marianne, who famously dated Sir Mick Jagger for four years, had her first hit in 1964. She recently released her 23rd album Horses & High Heels and will perform three UK dates on her world tour in May.